October 23, 2014 0 comments on "How to Save Energy in Your Home"
With so many appliances stuffing our homes to capacity, and power available at the flick of a switch, it’s no wonder we can be quite careless with energy. Not only does this fill the wallet of you energy provider, but uses our natural resources unnecessarily. There are so many places we can save power, from fitting an efficient shower head in the bathroom, to turning off the TV at the wall in the living room. Choosing appliances carefully are important, such as using a front loading washing machine rather than a top loader, or selecting an evaporative air conditioner rather than it’s less efficient refrigerated air counterpart. 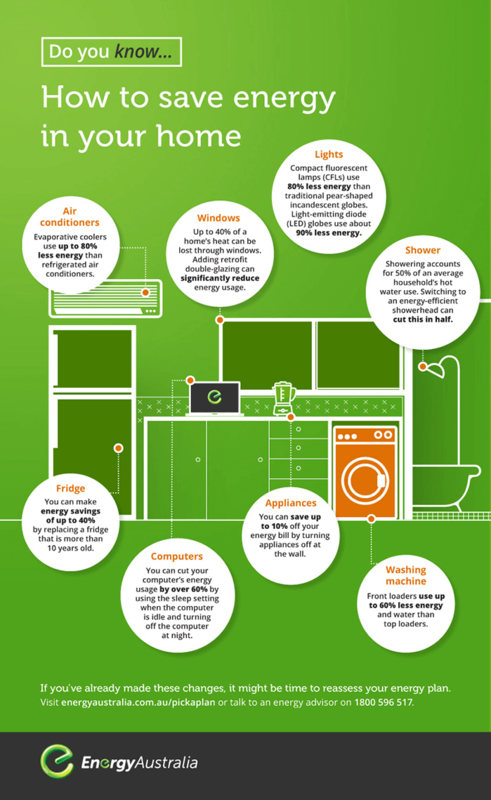 The graphic from EnergyAustralia details other energy saving ideas around the home, take a look and start saving $$$.